Janus emulsions, formed by mixing two oil components (i.e., olive oil (OO) and silicone oil (SiO)) with water in the presence of two surface active biopolymers, i.e., gelatin and chitosan, are investigated in more detail. The stability of Janus droplets formed strongly depends on the polymer components used. The mixture of both biopolymers represents an extraordinary effect which can be related to the complex formation of gelatin and chitosan. Taken into account that under the given pH conditions, in the acidic pH range between 4 and 6, below the isoelectric point of gelatin, both polymers are polycations, one can conclude that non-Coulombic interactions are of relevance for the enhanced surface activity of the complexes. 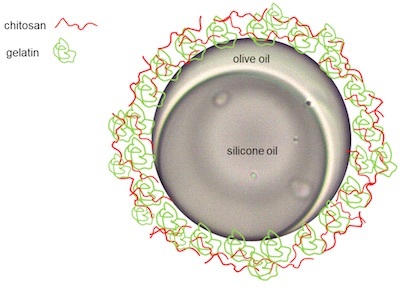 Dynamic interfacial tension (γ) measurements by using the drop profile analysis tensiometry (PAT) indicate a strong adsorption of the polymer complexes at the olive oil/water interface in contrast to the silicone/water interface. In a first step, the polymer complexes are adsorbed at the interface, and in a second step, a more rigid skin-like polymer layer is formed. This first example of a polymer-stabilized Janus emulsion opens new perspectives for the application, e.g., in food emulsions or for making scaffold materials.